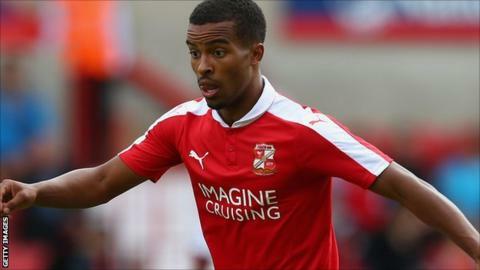 Swindon Town winger Nathan Byrne believes he is at the perfect club to seal a move to a higher level. Byrne, 23, scored a 16-minute hat-trick against Bradford on Saturday and hopes he can have a breakthrough season. "I love the club and the way we play," Byrne told BBC Points West. "If I'm going to be noticed, this is the best place to be. I don't think many scouts will pick another League One team to watch over us because of the style of football we play." He continued: "It's a credit to everyone here. I'm loving my time and whatever happens, happens." Midfielders Ben Gladwin and Massimo Luongo joined Championship club QPR following Town's League One play-off final defeat by Preston in May. Byrne, who joined Swindon in July 2013, admitted his hat-trick had been a "bit of a blur" and, having been given a more advanced role this season, he hopes he can add more goals to his tally. "To start like that is brilliant for me and the team," he added. "The manager has given me a more attacking role this year, I want to get more goals and more assists so hopefully I can continue like that. "I'm a confident player, I always believe in myself and I want this year to be a big year for me." Byrne, who began his career at Tottenham, is also happy to have swapped the number three shirt for his favoured 10 - which is worn by his idols Lionel Messi and Pele. "I knew before the kit numbers were released I'd be playing higher up the pitch and I didn't want to continue with three," he said. "I knew 10 was up for grabs, it's my favourite number on the pitch and a lot of my idols - it's their number. So the gaffer (Mark Cooper) gave it to me and hopefully I can repay him." Meanwhile, ex-Brighton defender Bradley Barry has signed a one-year deal with Swindon after a successful trial.